6-9pm, including cocktail hour, a special dinner catered by Montego Bay Grille, and awards presentation. Tickets will be on sale soon at $65 per person. Like the Hobart Chamber of Commerce Facebook page for updates! 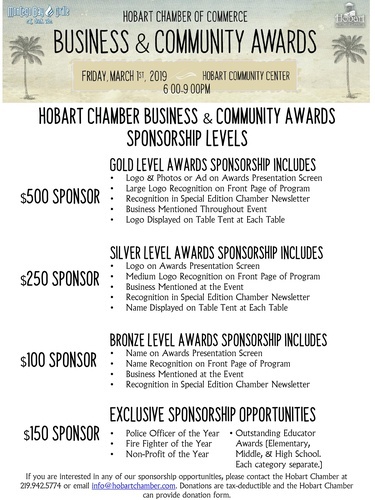 Awards to include: Business of the Year, New Business of the Year, Business Person of the Year, Volunteer of the Year, Police Officer of the Year, Fire Fighter of the Year, Outstanding Educators, and Non-Profit of the Year. Sponsorships available now including exclusive sponsorship opportunities of $150 each to sponsor: Elementary Outstanding Educator, Middle School Outstanding Educator, High School Outstanding Educator, Police Officer of the Year, Fire Fighter of the Year, and Non-Profit of the Year.